After completing her LLB at Dalhousie University, Jane served as law clerk to the Honourable Justices MacPherson, Cronk, Juriansz and MacFarland at the Ontario Court of Appeal, and then to the Honourable Justice Cromwell at the Supreme Court of Canada. Jane received her LLM from Harvard Law School in 2013. She is currently a PhD candidate in law at Queen’s University; her research focuses on the use of private law theory by Canadian courts to effect social and economic legal reform. She is a 2016 Vanier Scholar and an O’Brien Fellow. Before joining the faculty of law at UNB, Jane practised family law in Toronto and Ottawa. 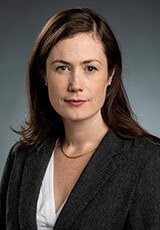 During her time in private practice she taught as a part-time professor at the University of Ottawa’s Faculty of Law.